Over the years, developments and technological advances in the home improvement industry have helped turn green solutions and energy-efficient upgrades into a must-have for every homeowner. It is no longer just about enjoying lower monthly utility bills, but also relishing the numerous benefits of reducing carbon footprint and living in an eco-friendly community. As a locally owned company, Green Air understands what homeowners in San Francisco truly need when it comes to upgrading their homes with eco-friendly and energy-saving projects. We are your trusted, family owned, energy solutions company committed to designing systems tailored to fit the unique needs of your home. HVAC System Installations, Repairs, and Maintenance – We have an extensive profile in heating, cooling, and air quality for both residential and commercial properties. Our focus is on providing you with a personalized service experience from start to finish. We also offer free system audits to ensure your HVAC appliances are in tiptop conditions. Custom Solar Panel Designs and Installation – We’ll work with you to deliver exactly what your home needs in terms of solar power. Investing in solar helps reduce or even eliminate your electric bills, while providing great tax credits. Roofing and Gutter Replacements – As a certified Certainteed® Master EliteTM Contractor and Certainteed Green Roofer, Green Air installs the highest quality roofing systems and backs them with stellar warranties for your peace of mind. We also install top of the line gutters and their protection systems so they can protect your roof from snowmelt and rain, for several years to come. 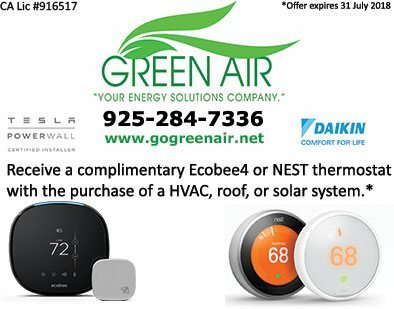 Give Green Air a call at (925) 62-SOLAR or (925) 28-GREEN to discuss your next home improvement project. We will be happy to provide you with a FREE and fair estimate. You can also reach us by filling out our contact form and we’ll get back to you shortly.